With what is going on right now in the Gulf of Mexico with that gushing oil well, wildlife, any wildlife, seems more precious. Even though I live in a subdivision, we are still have undeveloped areas around us and occasionally see wildlife in our yards. We used to see a lot more when we first moved here many years ago, but development seemed to displace our “wild” friends. Now, that neighborhood is more settled with mature trees and shrubs, we seem to be getting our wildlife back. I see a lot more box turtles and, yes, even snakes, now than I have in years. Last week we had quail in our back garden, something we haven’t seen in probably thirty years. 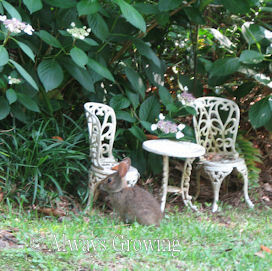 Last year, there was a brown rabbit that made an appearance in our back garden. We used to see rabbits all the time when we first bought our home, but gradually we saw them less and less. Last week I twice disturbed something while watering the garden in the early morning, but it was too fast for me to make out what it was. I now think I have solved that mystery. Yes, a little brown rabbit must be living nearby. I have seen it mostly near the area where my neighbor has let underbrush develop between our properties. There used to be possums living under their garden shed, but we have trapped and relocated those, so maybe the rabbit has moved into the old burrows. Who knows? I am just glad to see that our area has become hospitable to not only birds, turtles, quail, but now a rabbit. The snake, now, is another matter. I am not so sure that is as welcomed a little visitor. We certainly have been enjoying the lilies that have been blooming for the past week. I haven’t been growing lilies very long. In fact, I think this is only about the third or fourth year I have had any in the garden. Not many people seem to be growing lilies here in South Louisiana. If you do see them, they seem to be in older neighborhoods, probably lilies that have been there for years. 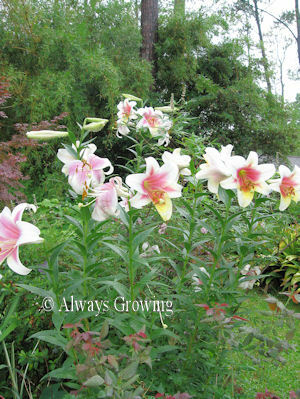 In fact, it was when I was driving through an older area and saw a stand of Easter lilies, that I decided to try growing them. 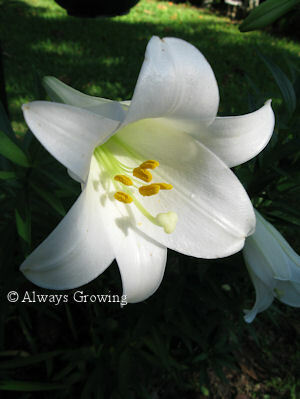 I got my first Easter lilies (Lililum longiforum) from Brent and Becky’s Bulbs. These bulbs have been fantastic – blooming and multiplying. When the Easter lilies did so well, I decided to try other ones. Since we have such rainy, hot and humid weather, local experts tend to caution against certain lilies. 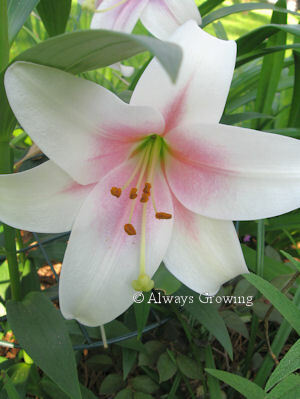 So, when I decided to plant more lilies, I went with ones similar to L. longiforum. So, I next tried what I later found out to be a pretty tough lily – Triumphator. The ones I bought last year from Brent and Becky’s are blooming now along with the white ones. 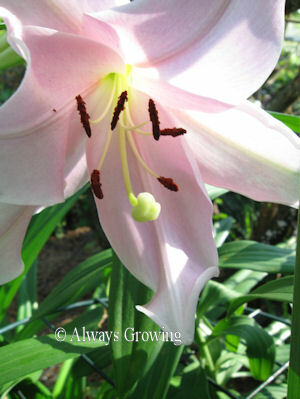 This year I added Lilium longiforum ‘Pink Heaven’ which has already bloomed earlier this month. 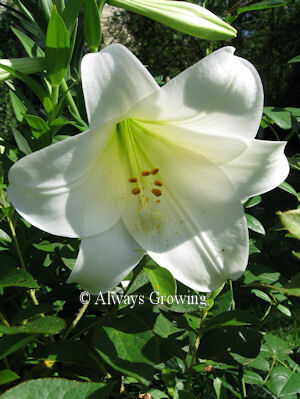 Since I have had so much fun with these lilies, I may start expanding my choices and try some others. Maybe the experts who say lilies don’t do well here just haven’t tried the right ones. 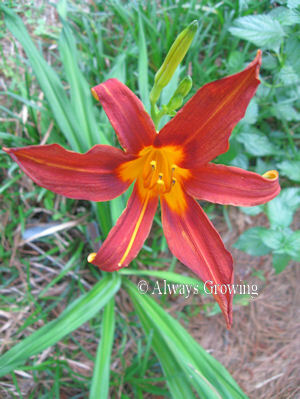 Several of the daylilies that I put in just last year are starting to bloom. Seeing them starting to flower makes me want to go out and buy more. I bought Scarlet Orbit at a garden show based only on a photo. It bloomed today, and I am so pleased with this red flower. It really is a deeper red than the photo shows. 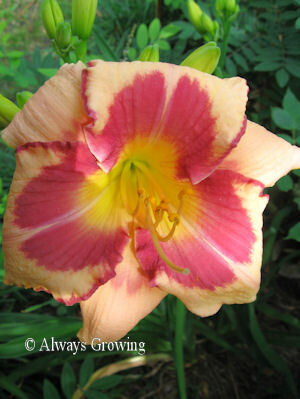 Frank Gladney is another daylily I bought at the October garden show. 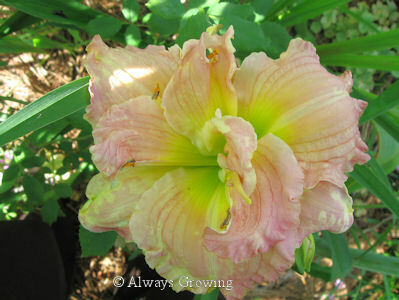 The picture the seller had that I based my purchase on didn’t do this daylily justice. It is a big, beautiful flower. 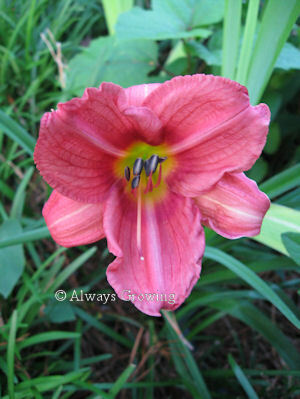 Rose Passion, a daylily I have had for several years, also had a flower that has made an appearance. 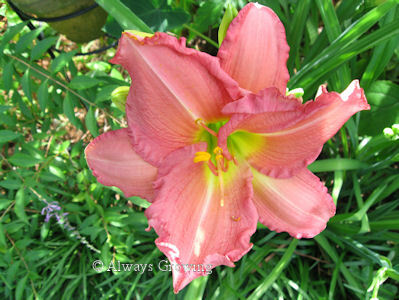 There are a few more daylilies that are yet to bloom from the same garden show. It will be nice finally to see in person a flower I picked out just from a photo. We have had two days with afternoon showers. Very welcomed afternoon showers. 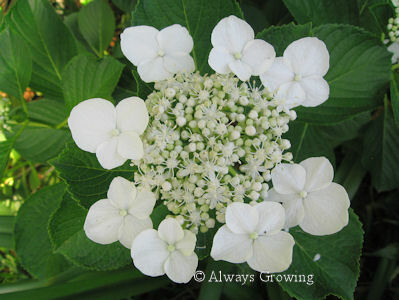 Shrubs that are particularly happy to see this recent rain is the hydrangeas. 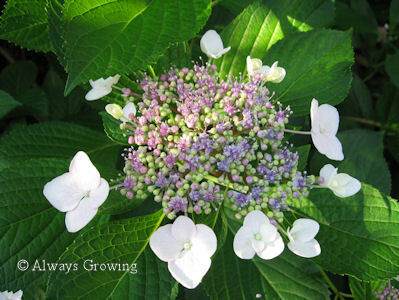 In the past three years, I have been putting in more hydrangeas. They like my garden because of all the shade. I like them because of the flowers. 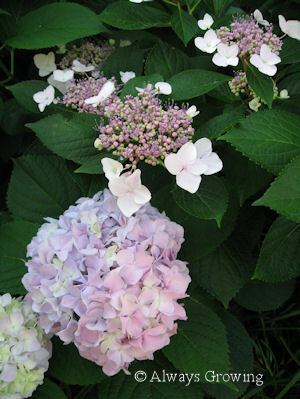 I also grow the mophead hydrangeas – white ones and pink ones. After they finish blooming, I am going to take cuttings to make more plants. I need some more mopheads and white lacecaps (seems like I can’t have enough hydrangeas). Nothing like hydrangeas to make a summer garden seem complete. Everyone seems to be remarking about the effects of the unusually cold winter we all had. Effects that are still being seen now. I lost a few plants that were tropicals, but I also seem to have lost a few plants that are hardy here and have returned in previous years. I haven’t given up entirely on some of these plants returning especially after what has popped up and was noticed this weekend. Yes, the sweet potato vine, Margarite, has returned. I had this variety plus other sweet potato vines growing all around the garden, and they have reliably returned for about five years now. With the unusual cold, especially in January, I was certain that I would have to replace them this year. The thick layer of pine straw mulch must have protected the tuber enough so that it has survived. This is the only one so far that has shown up, but I am hopeful that others will not be to far behind. I noticed a few of the caladiums in the front garden have started showing up. I didn’t think any would return after the cold, wet winter we had. They are in a well-drained area, but still, I didn’t think any would return this year. Maybe this winter wasn’t as bad as I thought. Some of these “survivors” certainly have surprised me by surviving. Third year must be the charm. They say that it is the third year that perennials are in the ground when they finally start growing well. It’s the old saying, “The first year they sleep; the second year they creep; the third year they leap.” Well, my clematis seems to be proof this old saying is true. 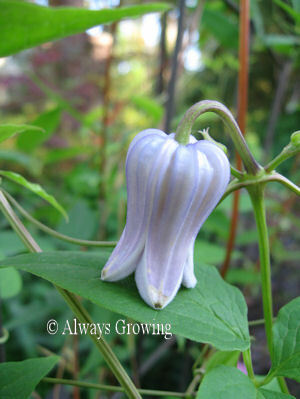 Three years ago, I planted Clematis crispa, and it did produce a few flowers that first summer. Last summer, it was better. But, this year is certainly a big improvement. This year, even though we had a very cold winter that lasted into March, this clematis came back faster, bigger, and better. In the past, the flowers didn’t start showing up until June. 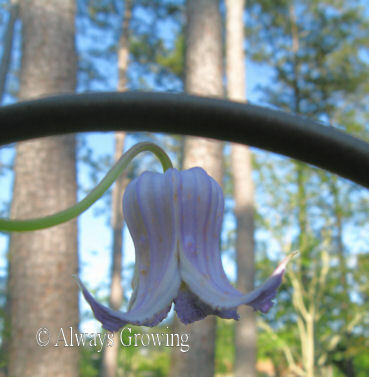 Even though everything this year seems to be blooming at least two to four weeks later than normal (again, due to the late, cold weather), the delicate, blue, bell-shaped flowers have been showing up for over two weeks. I had wanted this vine for several years before I finally found one at a local garden show. It has really been a nice addition to the garden, lending a delicate quality that was needed. When some of my dormant plants return in the spring, it is like old friends, who one hasn’t seen in months, returning for a visit. 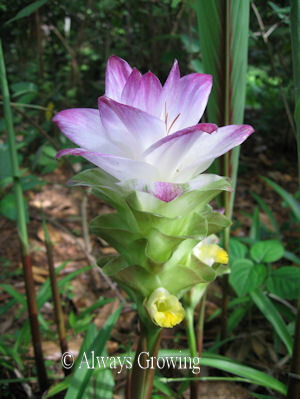 One of my favorite summer plants is Hidden Ginger (Curcuma petiolata). I love the banana-like leaves which add a real tropical feel to the summer garden. The areas where I have it planted give a great deal of privacy during the warm months when we are outside so much. 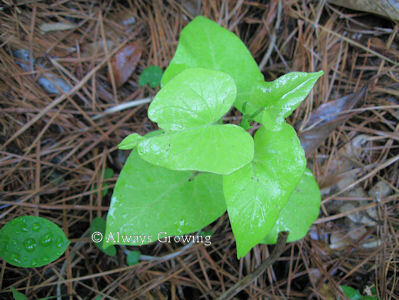 The leaves grow to about five feet tall and have a dark red stripe down the middle of the leaf. Even though I grow this plant for the foliage, the flowers are stunning, too. Now that my plants are older, I am getting more flowers than ever. The flower of this plant almost looks fake. The flowers come out before the leaves start showing. In the above photo, you can see the leaves have just started growing. Soon the flowers will be hidden by the foliage. 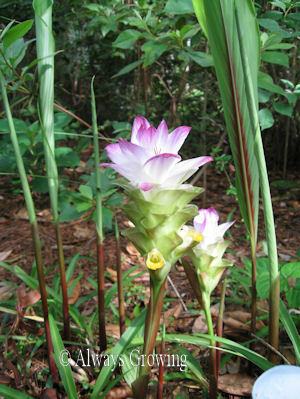 The flowers stand about 18 inches tall. This particular grouping has only been in the ground two years; my older plants have more flowers. Until the leaves get to be full size, the flowers are the real show. The colors are so vibrant. The white and fuchsia-purple really stands out. 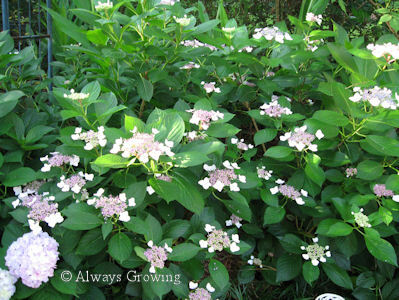 While this plant is hardy to only zone 7, it would make a great pot plant for colder areas and shady areas in all zones. I look forward every spring to the return of this “old friend.” So glad it came back. The last two weeks, my job has been very hectic. I barely have time to check on the garden because I have been getting home so late. I can hardly wait for the beginning of June and vacation. Even though I haven’t been able to get out very much in the garden, the garden has been carrying on fine without me. 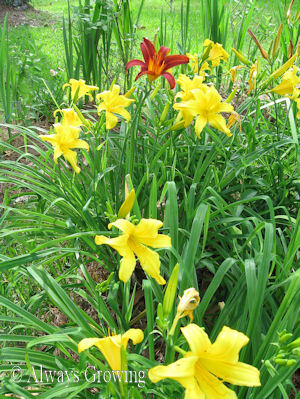 More daylilies have started blooming, and even more have buds forming. The yellow unknown ones that my mother gave me are really blooming now. 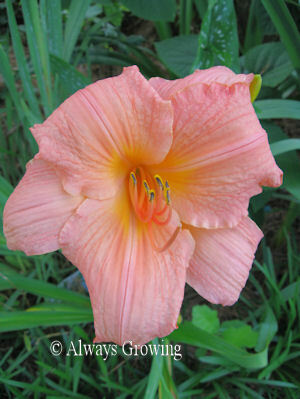 Misty Mayhaw is a reliable repeat blooming daylily. The sturdy stalks and flowers have really stood up to the rain showers we have been having lately. 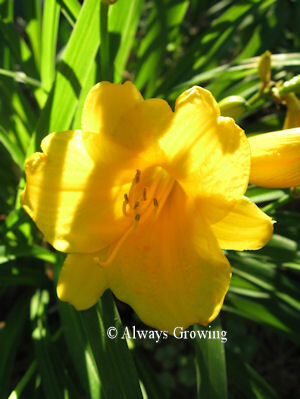 Eye yi eye is another daylily that has just started blooming. This year the color seems a little different. More pink than orange. It is strange how flower color can gradually change over the years. I think things are starting to get back to normal with the job. I sure hope so because I want to be able to enjoy the garden with all the new flowers opening up every day. 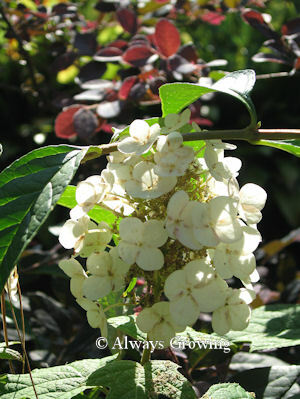 I have been so busy lately, I even missed Garden Bloggers’ Bloom Day, the first time in years. Less than two weeks and vacation time, which means I’ll have time to putter around in the garden. My idea of relaxation. Around this time, every year, I become very nostalgic. 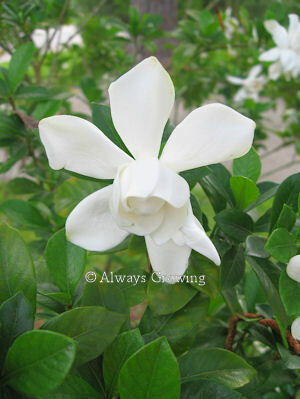 It is what I like to call “Gardenia Time”. You see, years ago, this was the time that we were looking to buy a house. We had found out just recently that we were to become parents and needed to move out of an apartment. 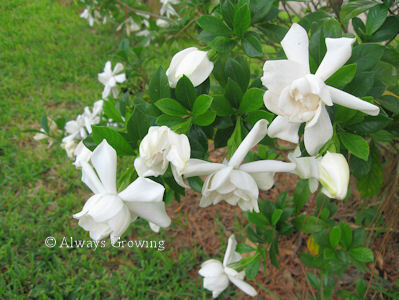 When we came to tour the house we eventually bought, there were many gardenia bushes, and they were in full bloom. These old, established shrubs were covered in white flowers, and the aroma was incredible. I am sure all those flowers had a big impact on our decision to buy this house. Through the years, unfortunately, we have lost many of those original shrubs, but there are still a few around, and replacements have been added. All of them have started blooming and bringing with those blooms, memories. 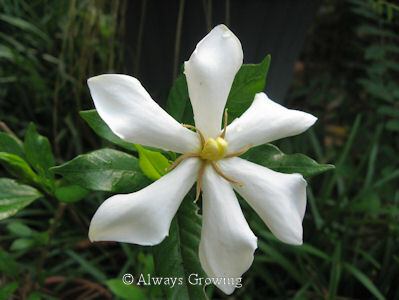 One of the gardenia bushes that has been added to the originals is the Daisy Gardenia, a single-bloom gardenia. This one, my mother rooted for me from her bush. This makes it twice as nice. It is said that the sense of smell is the most evocative and brings back memories the quickest. Whenever I walk out into the garden at this time of year, I am immediately brought back to a time when dear hubby and I were embarking on new adventures – home ownership and parenthood. Whenever I buy a new plant, I can hardly wait for it to bloom. Lately, I have been dreaming of the daylilies, the ones I purchased last summer as well as the old favorites that have been in the garden for years. This year, I have had to wait a little longer for the daylilies to bloom since this year’s blooms are almost a month behind previous years’. The first to bloom this year was an old daylily that my mother gave me from her garden. These daylilies must be from the ’60’s. I know they have been in my garden at least twenty years. 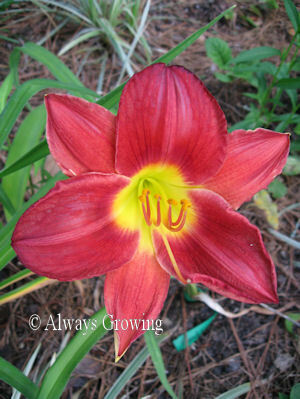 The next daylily to flower was good, old dependable Stella d’ora. This spring, I moved a few of these to join up with several others I had in one bed. I think having a mass of these makes a better show. The final one to bloom this week was one I bought and planted just last year. It was unlabled, but it certainly is a pretty pink and seems to be very vigorous. It looks like it might grow enough this summer that I can divide it in the fall. Most of the other daylilies growing in the garden are showing buds, so it looks like I will be doing a little more daylily dreaming over the next few weeks.